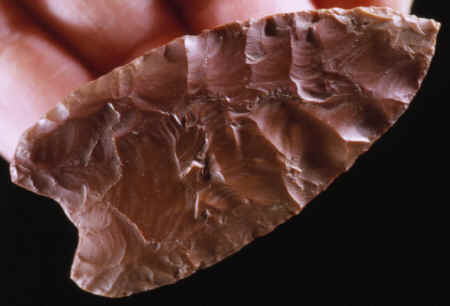 This Clovis point was found during the excavation of the Colby mammoth kill site in 1975. It was found in bone pile number 2 below a row of ribs. This point has the "Colby style base" which is a base that is more rounded and a concavity that is becoming almost "notched". If the concave area was more uniformly flaked all the way to both edges it would look more like a typical Clovis point. This point was probably resharpened at least one or more times. It's made of a dark red Phosphoria Formation chert and measures 2 3/16 inches (56mm) long.